During the climb, Walsh encountered one scary moment, recalling, "I was 15 to 20 meters above the belay. I had to climb up this tower of rubble to get to this next crack. My bigger gear was lower down, and I only had two micronuts in. It was 5.11 climbing, and I ended up down climbing like eight meters to a ledge and made an anchor and then pulled the rope so Wharton wouldn't have to climb off the micronuts. I didn't even want to commit body weight to them. It was spicy all the time. There are many times you have to trust in your own skills and instincts." 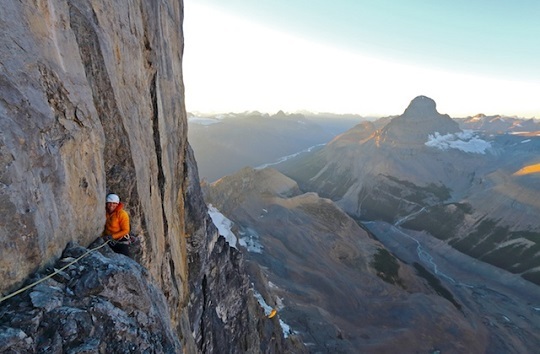 Walsh has no plans to repeat the wall, as he states, "I don't do the big routes in the Rockies that I've already done. Once is enough." Adding in his blog, "Hardest route in the Rockies??? Maybe...."